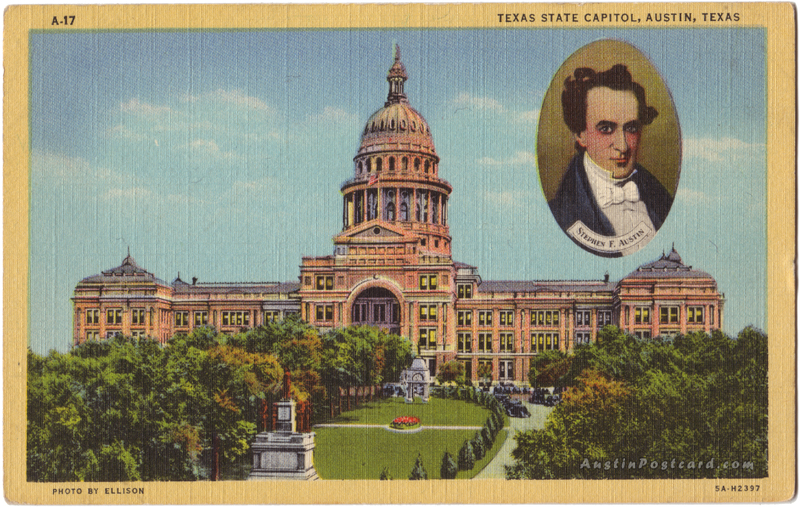 Text on Back: STATE CAPITOL — This great granite building cost three million acres of Texas land. 70 miles of railroad were built to haul this granite. The dome is seven feet taller than that of the National Capitol at Washington. The building is covered with copper plates. Stephen F. Austin, father of the Texas Republic. Austin, one of the "Empresarios," or colony chiefs under the Mexican regime, was probably more responsible than any other single man for the success of the movement for Texas Independence. He is known as the "Father of Texas."